Knockout mouse models, knockdown approaches with RNAi and peptide-based disruption of direct AKAP-mediated protein-protein interactions in both cell and animal models have revealed crucial roles of AKAPs in compartmentalized cellular signalling in a variety of disease-relevant processes. Presently, AKAPs are not targets for drugs. However, based on the data obtained with peptides disrupting direct AKAP-mediated protein-protein interactions, the development of agents targeting such interactions for therapeutic purposes appears feasible (e.g. cardiovascular and renal diseases). Candidate agents include improved, stabilized peptides, peptidomi-metica and small molecules. Such agents, interfering with signal transduction processes in defined cellular compartments by modulating selectively direct AKAP-mediated protein-protein interactions, may have fewer side effects than conventional drugs. Displacing selected proteins from complexes assembled by scaffolding proteins is likely to cause subtle local changes in signal processing that do not affect whole cell functions. Such agents are also likely to act more specifically than RNAi, which downregulates protein expression and thereby interferes with all interactions of a protein. 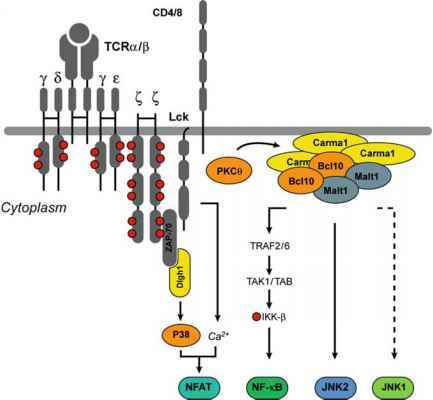 The new approach may lead to alternative strategies for the treatment of diseases associated with altered cAMP signalling that are not addressed by conventional pharmacotherapy. For a rational search of agents specifically interfering with the function of a given AKAP by modulating its interactions, it is necessary to solve the 3D structures of all relevant AKAPs. On the basis of structural differences between interacting domains, selective AKAP modulators can be developed. Acknowledgments This work was supported by grants from Deutsche Forschungsgemeinschaft (Kl 1415/2-2, 3-1 and 4-1), the European Union (project thera cAMP-proposal 037189) and the GoBio programme of the German Ministry of Education and Science (BMBF).